An Anterior Cervical Discectomy and Fusion (ACDF) is performed through the front of the neck, and is less painful than operating from behind the neck. It is done to correct a large disc protrusion, when the entire disc needs to be removed, either to remove the diseased disc, or to get to the ruptured portion of the disc, which is at the back. A spacer, usually made of artificial plastic, is placed in the disc space to ensure it does not collapse. This is filled with small pieces of bone. The two adjacent vertebrae will then knot together (fuse) within six to 12 weeks. This surgery carries a small risk of developing permanent “hoarseness” and there is usually temporary difficulty swallowing, because the voice box and throat need to be pushed to one side at the time of the operation. Cervical fusion is also performed from a posterior approach, usually in conjunction with a cervical foraminotomy or laminectomy. 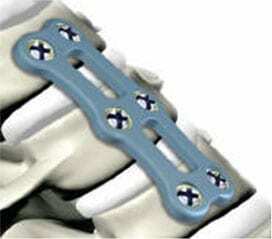 The surgery involves placing screws into the bone and connecting them to small rods. Called “lateral mass screws” because they are placed into the bone of the lateral mass of the vertebra. The screws can be placed into all cervical vertebra from C 1 down to C7 and can be connected to the thoracic spine. They are highly effective in alleviating pain from arthritic degeneration , stabilizing fractured vertebra after trauma and maintaining stability in patients with instability or tumours.